For Local Cops In Germany, No Talk Of 'Sanctuary Cities' Establishing trust with the million-plus recently arrived migrants is a challenge for local police in Germany, whose duties include deporting people ruled ineligible to stay in the country. That can lead to chaotic scenes. In May, in the town of Ellwangen, police say a hostile crowd of migrants forced them to release a man they had come to deport. Sometimes, police try to take deportees by surprise. In July, in the eastern city of Chemnitz, police showed up at the state government office for foreigners to deport a family from Chechnya. When the cops appeared, the mother of the family pulled out a kitchen knife and slashed her own arm. The police responded with pepper spray. 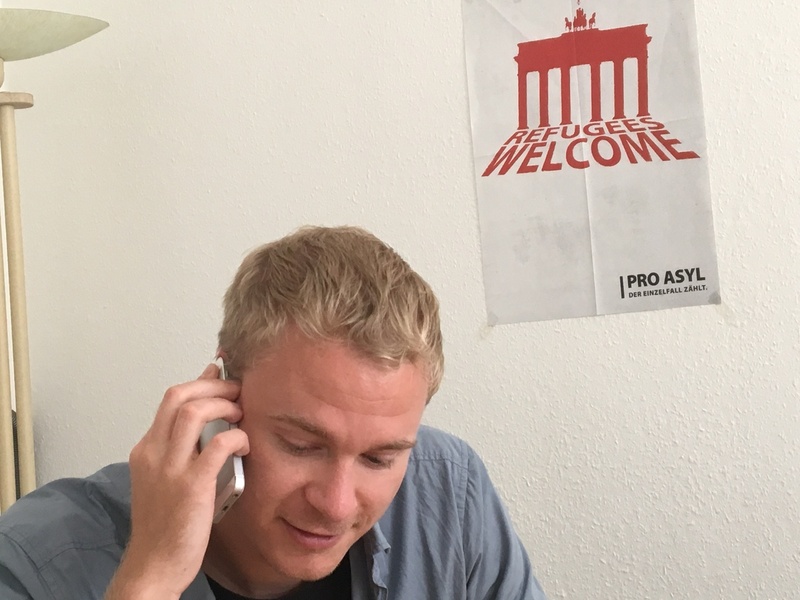 Dave Schmidtke is a social worker with the Saxony Refugee Advisory, a group that seeks to help migrants stay in the country. He says deportations undermine newcomers' trust in police. "I just saw blood all over the floor, this woman who was screaming, and I thought, 'What's going on here, please don't tell me you still want to deport this family,'" says Dave Schmidtke, a social worker with a nonprofit called Saxony Refugee Council, who arrived on the scene soon after. Eventually, the family's deportation was postponed. Stories like this make other migrants leery. Idris Direy is a Somali who arrived in Germany nine months ago, and whose legal right to stay is undetermined. He spends his days hanging around Chemnitz's central plaza with other East Africans, and says police stop him about once a day to check his ID and have him show them the contents of his backpack. He's worried that one of these days, the encounter will go further. "One day they come to you and say, 'Get your stuff, it's time for deportation,'" he says. Chemnitz police spokeswoman Jana Ulbricht says these searches are permissible in higher-security areas such as the central square. When asked about tension between migrants and police, she points to the migrants' backgrounds. Jana Ulbricht is a spokeswoman for the police department in Chemnitz, Germany. "I think the refugees have a very different experience of police in their home countries," she says. "In their homelands, they don't have the concept yet that we have here in Germany of police as friend and helper." "I think the refugees have a very different experience of police in their home countries," she says. "In their homelands, they don't have the concept yet that we have here in Germany of police as friend and helper." But Dave Schmidtke, at the Refugee Council, doesn't see how migrants can learn to see police as friend and helper, given the current system. "[Migrants] are afraid of talking to police people, especially as a witness or something, because they are always thinking, 'Maybe some of the information is getting used to deport me some day.' "
In the U.S., the response to this problem is often the "sanctuary city" approach, in which local police avoid participating in immigration enforcement, and county jails restrict how much information they share with federal officials about foreign-born inmates. In Germany, though, that idea seems to be a non-starter. "I can't believe that would be a German idea," says Sven Hüber, a chief inspector with the German federal police and an official with the country's biggest police union, the Gewerkschaft der Polizei. He's strongly pro-immigration, but he doesn't see how you can put up a barrier between police work and immigration enforcement. "It's a matter of security. Especially because during the wave of migrants in 2015 and 2016, we realized there are some people coming whom we need to watch very, very closely and keep tabs on them," Hüber says. He says German police shouldn't be shielded from the unpleasant reality of deportations. Cops should know what it's like, for example, to roust a peaceable family out of their beds at 5 a.m. to put them on a plane. And he's suspicious of any suggestion that deportations should be handled by some kind of separate, specialized law enforcement agency, such as the Immigration and Customs Enforcement (ICE), in the U.S.
"If those officers' job consist of nothing but catching people to deport them, people whose only crime is being in the country without permission — what does that do to those officers?" he asks. "What does it to their heads and their souls?" Germany's history makes the topic of deportations especially sensitive for police. The German word "deportation" has echoes of the Nazi era, so officials tend to use a modern euphemism, "Abschiebung" — literally, "pushing off." Deportations are rarer than in the U.S., and the appeal process tends to be more drawn out. But impatience with that process is growing, even among police. Hüber admits the current situation has been a "challenge" for some rank and file. 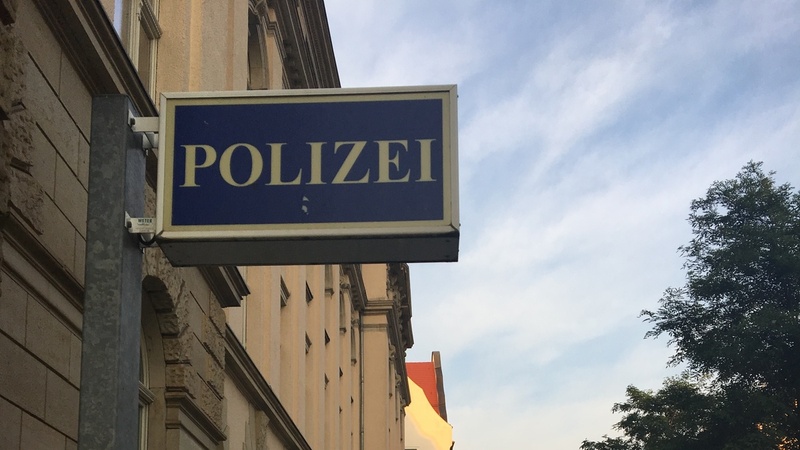 His union recently asked the federal government to pay for "political education" to help police adapt to Germany's new reality as an immigrant nation, but Hüber says the request was rebuffed. The relationship between local police and migrants also depends a lot on the politics of the state, because states play such an important role in deciding who has to go home. For instance, deportations are less common in Berlin, which has a leftist state government. In Bavaria, where conservatives are in charge, deportations are more frequent. 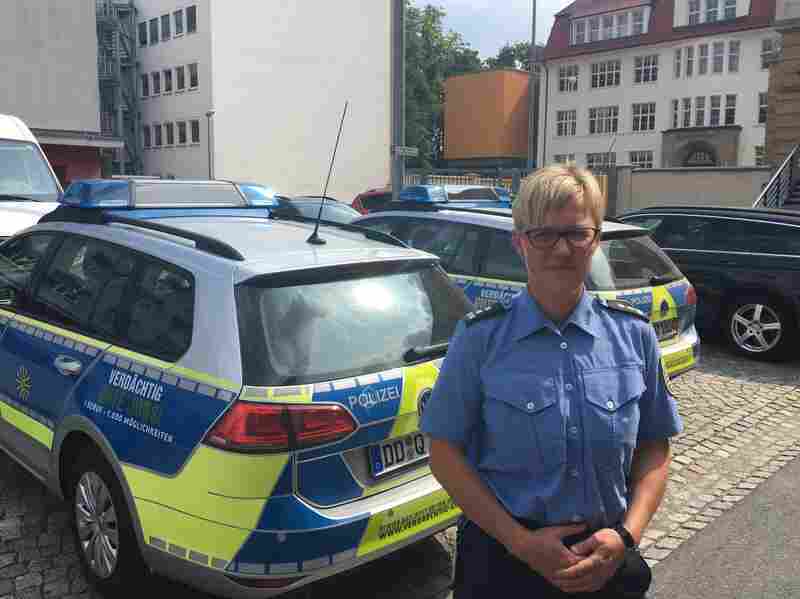 A few local police departments have tried to diversify their ranks by recruiting more officers with, as Germans put it, "a migration background." 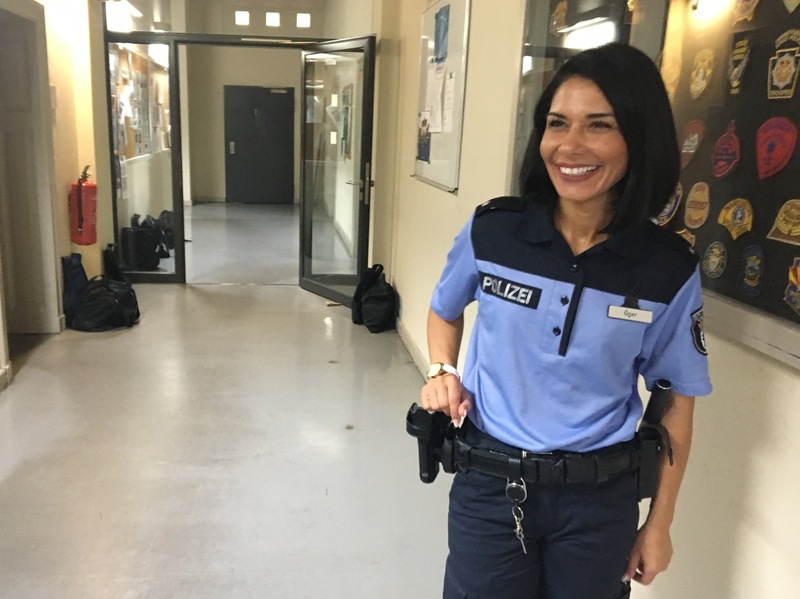 Mehtap Öger is a German of Turkish descent and a rookie officer with the Berlin police. Some departments are trying to recruit more officers with "migration backgrounds," to improve relations with a diversifying population. One of them is a 34-year-old rookie in Berlin named Mehtap Öger, who comes from a family of German Turks. She says her background comes in handy sometimes — for instance, when she's able to speak Turkish to people whose German is shaky. She says she feels supported and accepted by the department, but occasionally she sees glimpses of an older mindset. Once, she says, as she rode along in a squad car during her training, "A colleague said, 'There's nothing around here but black-heads.' And he knew very well I was in the car and that I belong to those people." She doesn't let it bother her. After all, she says, he was an older officer, a year from retirement. "That's hard-wired in their heads," she says, "and there's not much you can do about it."